My MP3 player was residing in an odd sport sock, definitely not a classy case. With my new fascination with sock knitting, I was practicing the Aloha cast-on on circular knitting needles. 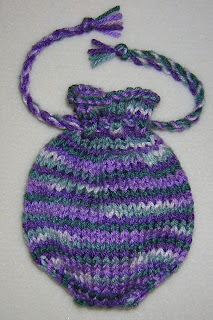 Using a scrap ball of worsted weight yarn and 10 1/2 US circs, this little bottom up bag sort of magically grew on my needles. It is about 6 inches tall by 5 inches wide. Here are the general instructions for worsted weight yarn and 10 1/2 US circular needles. Change them as necessary to get the gauge or size bag you desire. Note that an even number of stitches on each needle are required for the decreases and eyelets to distribute evenly. Using the Aloha cast-on, cast on 8 stitches on each needle. Knit the first round. Next round and those remaining until you have a total of 22 stitches on each needle: Knit 1, increase one in the next stitch and the next to the last stitch, knit last stitch on each needle. Then knit even for about 3 inches. Decrease: Knit one, knit 2 together every stitch then knit last stitch on each needle (12 stitches remaining on each needle). Eyelet row: Knit 1, *YO (yarn over), knit 2 together* repeating until last stitch, YO then knit last stitch. Knit even 4 rounds or so then bind off with the Stretch Armstrong sewn bind-off. Make 2 twisted cords and thread through the eyelets for drawstrings. I started with 3 yards of yarn folded in half for each cord (each cord has 4 strands of yarn). Let me know if you make a bag! I would love to see it! Lovely! Looks like your practice is not in vain! LOVE the colors! What fun yarn! I am not feeling very smart. Not clear how many stitches initially. If on decrease will have 12 in middle and 2 on each end = 2+24? For total stitch count for two circular needles, just add the number of stitches on each needle. So, if you have 8 stitches on one, you will have 16 stitches, total. 22 = 44 total. 12 = 24 total. I would love to make your MP3 bag, but..I downloaded the Aloha Toe information and IF I can get past the casting-on instructions, I don't understand how the sides of the bag are connected when you're knitting each side on one of the two circular needles. What am I missing? You are carrying the same yarn around and around as you knit the stitches on each needle, making a tube or bag, in this case. I don't knit with straight double point needles (what some people use to knit in the round) so I can't give you a definitive answer. Sorry! Maybe you can find a knitter who can help you with that question on one of the Ravelry boards or a knitting list on Yahoo. I made your bag... I needed a vacuum cleaner accessory bag, small, and this pretty much fit the bill. Addi Click Lace doesn't have a 10.5 so I used an 11. I also added .25" to the length, instead of 3" I did 3.25". I will take a picture of it, but I don't see where I can add one here. I am not sure I can authorize you to upload a photo but I can add one if you send it to me. Click on the profile link and you can find a link that should bring up an email in your account. Never heard of the Aloha Cast On before and am unable to locate it. The link here is broken. Can/will you help clarify what it is? Roxanne, unfortunately the author has taken down her website with free instructions and her sock knitting book that includes the cast on was never republished. Her cast on was basically a long tail cast on for two needles. It forms a row of sturdy purl bumps at the toe. Since there is ridge at the toe, it is not popular with sock designers because they are aiming for a seamless look at the toe. You can substitute Judy's Magic Cast On and it will work just as well. My only reason for continuing to use the two needle long tail cast on is that I like the sturdy row of purl bumps and my experience says that it is easier to start knitting from the the cast on (the stitches remain tight and closely formed when manipulating the needles to begin knitting). Also, it is my opinion the Aloha Cast On is good for people who tend to wear their socks out at the toes and who can't feel the ridge.